The color “Purple” is defined by Webster’s Dictionary as a ‘dark blueish-red’. The color “amethyst” is defined as ‘1. A purple or violet quartz or corundum. 2. Purple or violet.’ The color “Violet” is defined as ‘a bluish-purple color.’ The color “Lavender” is defined as ‘a pale purple.’ No wonder carnival/stretch glass collectors are confused!!! 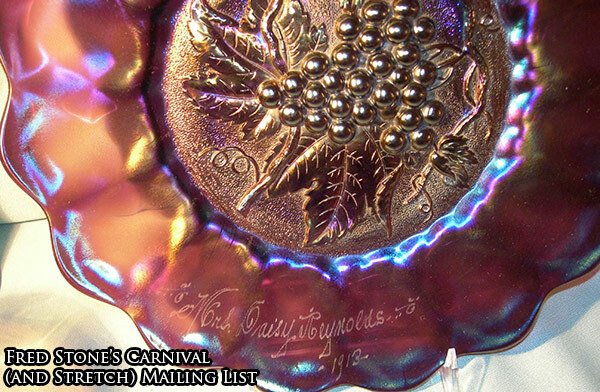 David Doty’s website (our favorite carnival glass author) defines “Purple” as ‘a deep color, rather like grape juice.’ “Amethyst” as ‘a somewhat lighter version of the purple.’ “Lavender” is shown, but not defined; but the three pieces of carnival on his website are of a lighter color than the amethyst. He does not mention violet. 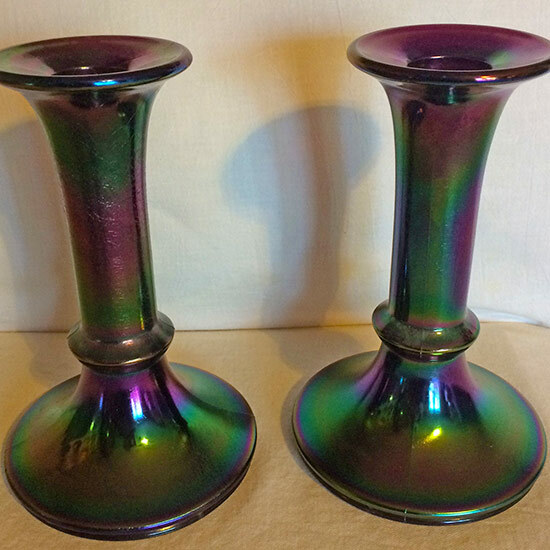 But he does say that the iridescence has nothing to do with the base color of the glass. To decide the color of the base glass, the piece should be viewed where the iridescence is not present. Usually this on underside of the base of the glass. No wonder carnival/stretch glass collectors are confused!!! The other variables that the two references do not mention, is that the thickness of the glass changes the color of the glass as we perceive the glass color. In reality, the color of the glass does not change. The other variable is that many men (mainly a male heredity trait) are color blind or partially color blind (in some men it is only certain colors). The other variable is that the companies in the teens and twenties did not have quality control such as we have today. Plus each company called their “purple” pieces a different name. No wonder carnival/stretch glass collectors are confused!!! Central Glass Works of Wheeling, West Virginia made a few pieces of stretch glass. Their color for “Purple” was purple, but sometimes it is actually a wisteria with blue tones. 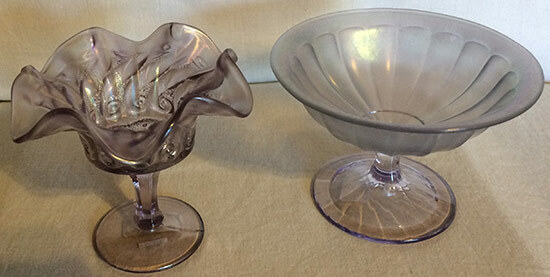 The 7” candlestick on the left (both pictures) was made by the Central Glass Works. The ruler in the second picture is to hold the Central candlestick as it wanted to roll off of the photography table. Look under the cup of the candlestick at the steps or Bugdoc calls them rings. Two for Central and 3 steps or rings for Northwood and Vineland. The candlestick on the right is a 6 3/4” Vineland as it has a medium cup height and the way the 3 steps or rings are placed. The Vineland Flint Glass Works at Vineland, New Jersey made a ‘Wisteria’ color in a dark and a light purple. The candlesticks above are in the dark wisteria color. Back to the Central Glass Works, this bowl was made by Central. 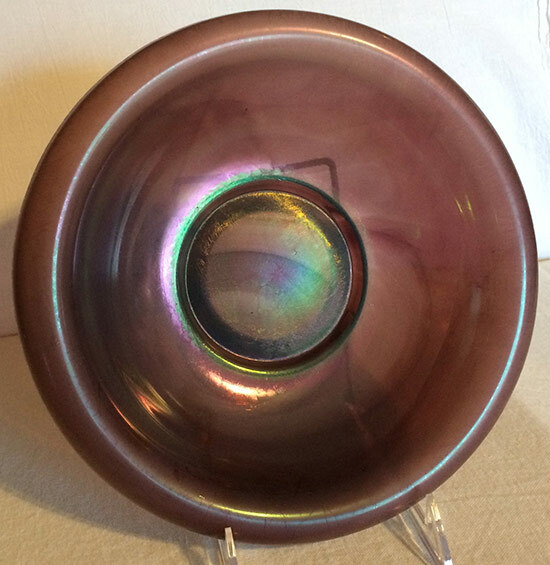 It is a translucent, but slag bowl. When this bowl was made, someone had not stirred the pot of molten glass in a long time. This picture makes the bowl look dirty, but it is really the slag in the mixture. Love the colors in the bowl in direct sunlight. 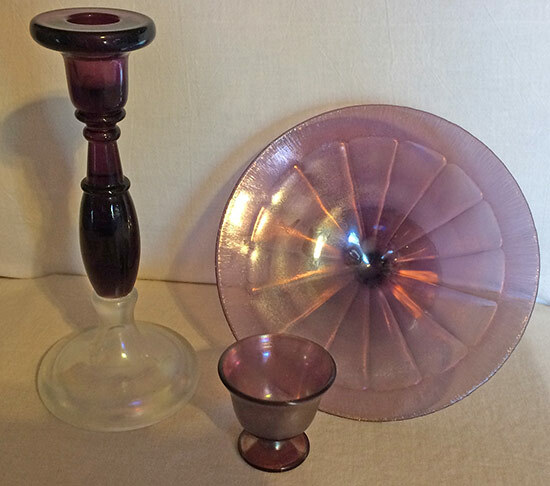 Diamond Glass Ware Company in Indiana, Pennsylvania made a variety of purple colors. Amethyst which was a light purple color. Midnight Wisteria which is a dark purple; doesn’t the name sounds mysterious? Plus an intriguing Twilight Wisteria which is a medium purple. 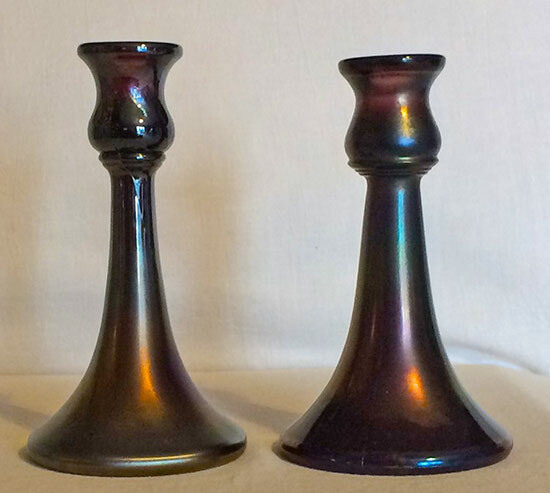 Needless to say these candlesticks are Midnight Wisteria color. The Fenton Art Glass Company was in Williamstown, West Virginia. They made a wistaria(sic) which was a light purple glass with varing degrees of shades such as light, medium and a dark wistaria(sic). In the original catalogs, wistaria(sic) was spelled wistaria(sic). In the Fenton books and Frank Fenton’s letters, wisteria is spelled with an “e”. When you go back in your time machine, let us know if the printer could not spell or it was meant to be spelled with an “a”. My computer doesn’t like wisteria spelled with an “a”! Candlestick is #549 with the white stretch foot and the clear wistaria(sic) cup and stem. #643 footed card tray. #923 nut cup in front. These were considered rare in wistaria(sic), but several turned up at one time. Now they have disappeared from the market; wouldn’t be surprised if a set of six was found and sold individually. Small cupped bowl #109 in a light wistaria(sic). 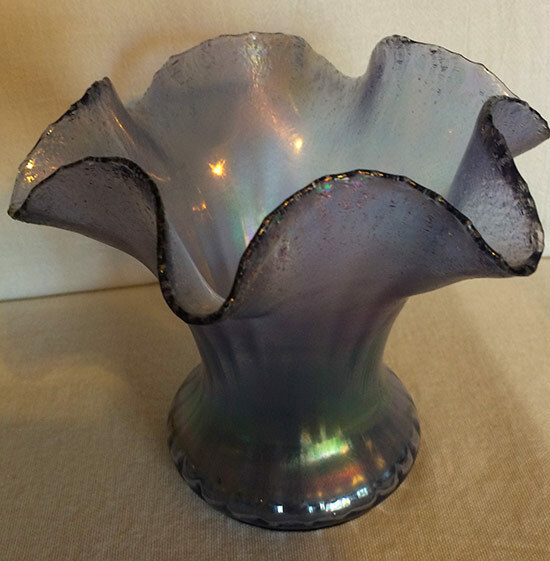 Imperial Glass Company at Bellaire, Ohio had Amethyst Ice color in their Satin Iridescent Line which was described as “crizzled on mulberry glass”. Pearl Amethyst was the color name for their Imperial Art Glass. 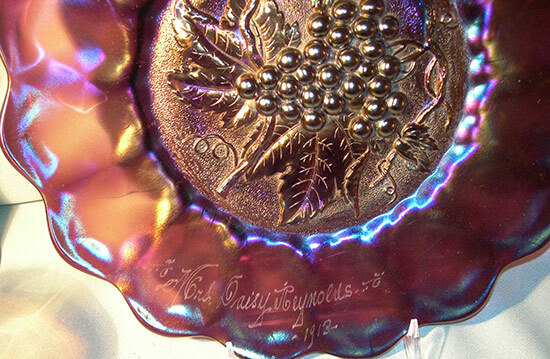 Amethyst Ice Heavy Grape Plate; note the engraving and date of 1913. Pearl Amethyst signed Imperial pieces. 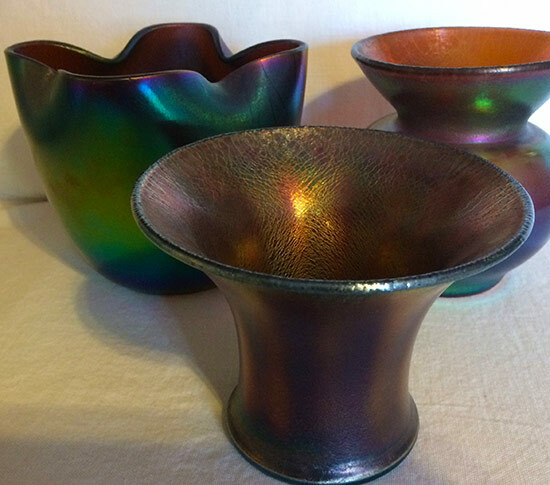 All are the same base color of glass, but have various iridescent colors that were sprayed on the hot glass (the spray dope had different formulas). H. Northwood & Company from Wheeling, West Virginia made a Royal Purple which actually is violet. Royal purple or violet has a blue hue to the purple color (not a red hue as with the other purple colors). It is very distinctive and screams Northwood Stretch Glass! 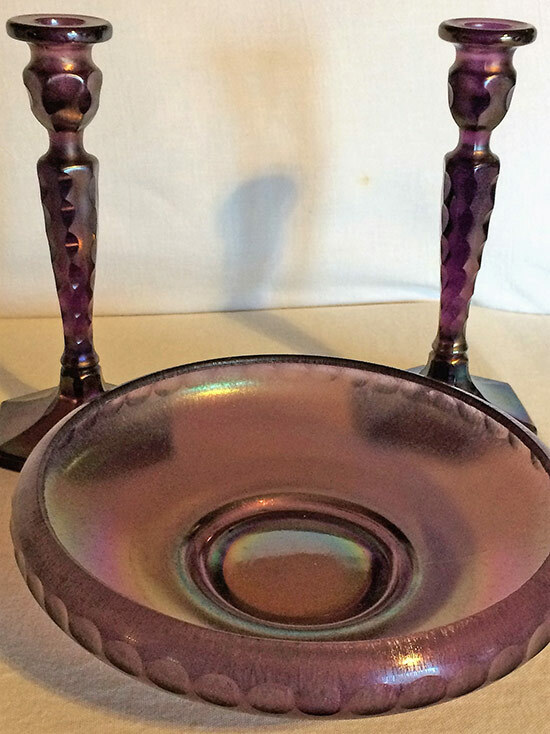 The carnival glass made by Northwood is the normal purple color. 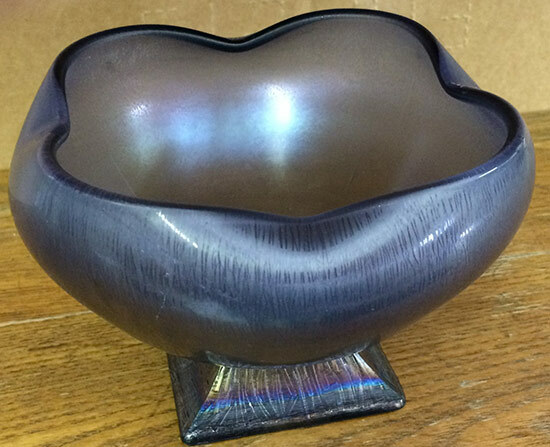 Look inside the mouth of this vase to see the violet color. 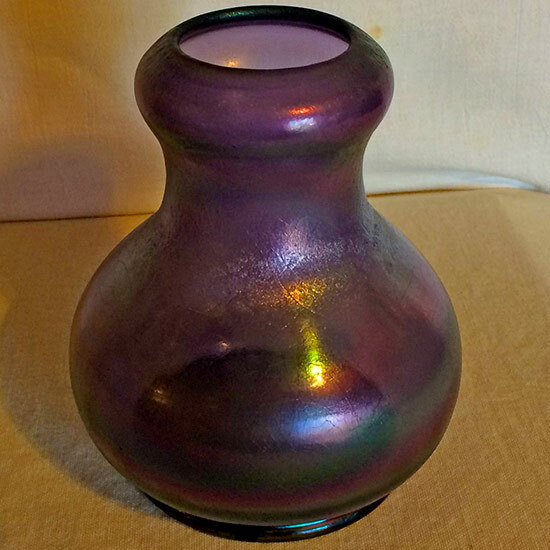 The Rib Optic Vase in royal purple is very difficult to find. Actually there are few Rib Optic Vases to be found in any color! #807 Tree Bark Base Compote in royal purple. The square base is an embossed pattern that was included in the mold. Whereas the top was formed by the finisher’s paddle. Then the dope was sprayed on and reheated for the stretch finish. King Glass Company from Pittsburg, Pennsylvania and the Tiffin Glass Company from Tiffin, Ohio were part of a combined company called United States Glass Company which also included other glass companies that did not make stretch glass. At the Tiffin Company there was a purple stretch color, but ours is packed away and couldn’t be found. A piece can be seen in the American Iridescent Stretch Glass book by John Madeley and Dave Shetlar. 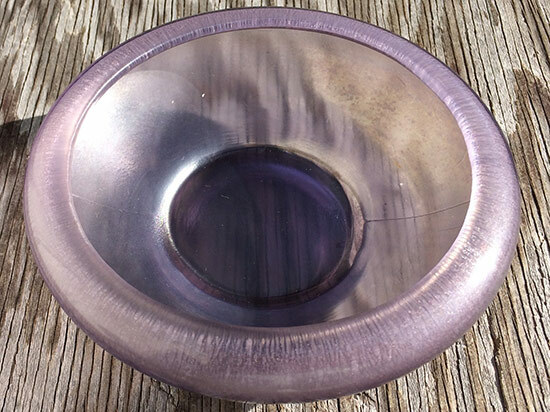 There is also a very rare opaque purple bowl #8076 with the open work on the rim. Vineland Flint Glass Works of Vineland, New Jersey made a Wisteria color both light and dark purple. Candlestick on the right was made by Vineland. The purple colors made in stretch glass define the makers of the glass more than the colors do in carnival glass. The last purple color that can be confusing to collectors is “sun colored glass” which is usually a light color. We have talked about the manganese in the sand mix that makes glass turn a light purple in sunlight in the past. A number of pieces of glass from Imperial do turn purple. We purchased a Dugan Constellation small compote that looks sun colored. In Doty’s book, a lavender color is listed; not sure if this is a lavender color or one that is sun colored. It doesn’t matter as we love the dainty little compote. Dugan’s Constellation compote on the left. Imperial’s Paneled compote on the right. In stretch glass, not all of the purples are the same although they may be called purple, amethyst, wisteria, violet, or even sun colored. Color in stretch glass is a big clue as to the maker. Hope you enjoyed seeing purple tonight. No wonder carnival/stretch glass collectors are confused!!! In response to Ardonna's picture and question about the Fenton Lemonade Cups in celeste blue, she was given the correct information. They are stretch glass from the 1920's era made by the Fenton Art Glass Company. They are fragile so would not hold them by the handles as they do like to pop off some were not annealed properly and that makes the handles pop off. With all applied handles, there may be small fractures in the body of the piece around the handle area.